A man in a green cadet hat, blue jeans and zip-up hooded jacket walks into a classroom of 14 students. With a bright smile on his face, he explains all the reasons why audio is “awesome” while capturing his students’ attention with his abstract drawings and enthusiastic energy. His eagerness to pass on all he knows is undeniable and his adoration for the subject is infectious. You would never know this was his first year teaching at a college level. Mark Roach, a new adjunct instructor for the Fine Arts Division at MBU, brings a degree in commercial music from Millikin University in Decatur, Illinois, and several years experience in the industry. In 1996, between his junior and senior year of college, Roach spent his summer on the crew of a large traveling group from central Illinois, learning a great deal about live sound application. His senior year of college he mixed, engineered and produced a record for a jazz group called One Voice and that summer returned to the traveling group as a production crew chief. His credentials reach even further with his own personal journey as an artist. Roach, now an independent artist and producer, had always enjoyed teaching. Roach felt he had big shoes to fill. “He’s a fantastic instructor. 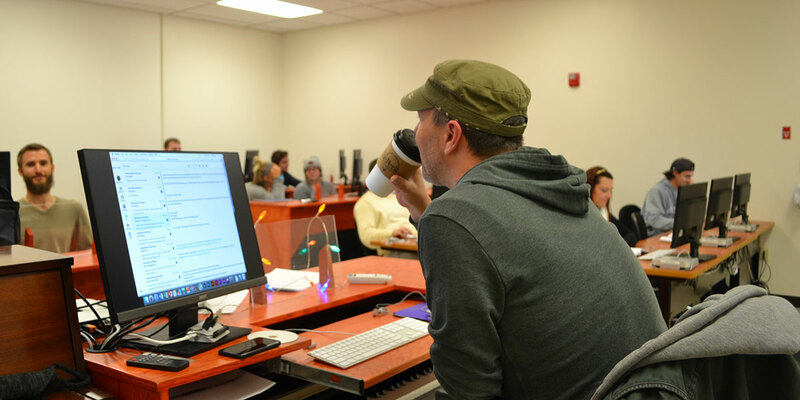 I’d probably say one of my favorite instructors I’ve ever had,” said Aaron Feeley, a junior at MBU who is majoring in broadcast media. Coming into a new career there are fears, and Roach was not immune to them. With this being Roach’s first semester this is a logical concern. Speaking with his current students it’s obvious that fear is not an issue. Roach’s students confirm that once he found his niche he flourished as an instructor. Roach is leaving his mark on many students’ lives and it will be interesting to see what the future holds for this young instructor.